Now you can learn anything online from the comfort of your home. Here I am offering online music lessons.You can learn Indian Music online with me. How to modulate your voice? How to increase your voice range? Which voice is better to use while singing? How to control your breathing while singing? It is very important for a singer to understand the above mentioned points. I am sharing one old bollywood song with you all. Please inbox me or contact through http://talkingbees.com to start your Online Music class. I am going to offer a 6 weeks summer Bengali Course in Nyc. In this course you will learn to read and write Bengali .You will be taught the Bengali script and will have clear instruction how to write Bengali letters. You will learn "How to draw the Bangla/Bengali letters".. the name of the Bengali alphabets. The hand writing is always different than the printed letters.So you need someone who can show you how to draw the Bengali alphabets.And its very important. But most of my students ,specially adult students they just want to learn how to speak Bengali and sometimes they are also interested to learn to read Bengali. According to me when you are learning a new language you should learn atleast to read even you don't wanna write. Normal rates are 30USD/Child /hour and 40USD/Adult/Hour . But Bengali Summer Course discounted fee :-- 300 USD / Children & 400 USD /Adult for the total course. Today I thought about sharing my view on the importance of script in learning a new language. Actually it is a debatable topic. Few will say " I want to start learning a new language with it's scripts." but many will say "No, I don't want to learn the script ,I just want to learn to speak. "So Today I am going to explain you which one you should go for. First when you are going to start a thing you have to think yourself how much do you want to learn? How deep do you want to go? How much time do you want to spend on it? And in short how serious are you about this? ---- If you can answer the above questions then you will have no doubt about the question I have raised at the starting of this post. I got so many students who never wanted to learn the script but just wanted to speak the language.It depends person to person.There are a kind of people they don't want to spend much time or energy on something or do things which has no reason or utility where there are some who goes for things they love or they have passion for. Its not bad when you want to utilize your energy properly. I am just sharing my experience. Actually if you just want to learn a language because you are going to visit that country or just to impress your spouse or in laws its fine to learn with out the script. But if your goal is to know about the culture or if you want to enjoy the literature or understand the society , people then you have to go through the script. You will have a better pronunciation if you start with the script. You will be able to see How beautiful the Devanagari script. is. You can read a book in the language (Bengali or Hindi or what you are trying to learn. You don't have to depend:- You can follow very good books in the language and help yourself.You don't have to depend on someone to read it for you. You can write in sign language : when you are in a place where you don't want other to understand what you want to say, you can use the sign language actually the new language you are learning. What do you think of it? I have been teaching a kid for last 5 years who does it often in her school :) !! You can read the signs,boards,advertisement written everywhere when you are in a new country. So there are so many benefits of learning the script.So I always suggest my Online Bengali / Hindi students to learn the script .So that they can help themselves. Right now I am in NewYork and available to give Bengali lessons face to face. I have already given a few lessons here. I am a Native Bengali Speaker & tutor and I have more than 10 years experience of teaching students worldwise online and face to face. I will be glad to teach you "how to read Bengali?" , " How to write Bengali?" 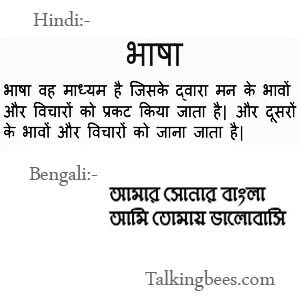 And "How to Speak Bengali? " Classes can be in groups or solo depending on the Bengali Student. I also give private classes to my student's place. Bengali Lessons are kids, adult or elders , everyone. If you are interested to learn Bengali, Hindi or Hindustani Music, you can contact me at Talkingbees.com. Or email me through the Contact us page.